Teamwork is a key part of any work environment. When everyone is helping out, productivity increases and safety becomes easier. A whole network of eyes can see more than any one person. Remind your workforce that they are all invested in the same bottom line - and make your workplace more comfortable, safer, and more efficient. • Banners make a statement - don't let anyone settle for less than their best effort. A banner reminds people to take pride in what they are doing - because they know that you do too. • Bold colors and large lettering reinforce your policies throughout the day. Don't just get attention - get results. 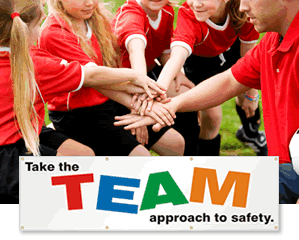 • Banners are printed on durable, reinforced vinyl with metal grommets for hanging. • Suitable for both indoor and outdoor use. Our high-quality materials and inks will give you years of use. 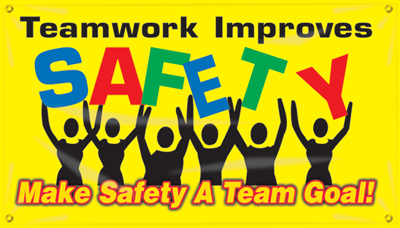 Company Teamwork, the Key To Safety! Go Home Safe Today! Others are Depending On You! Who Depends On You? Family and Friends, Company and Co-Workers, Customer. Work Safely. How do you spell Safety - SMART.